Since 2005, the Paratroopers of First Rock have cemented themselves as one of the premier units in our Nation�s military with their outsized contributions to Operation Enduring Freedom (OEF). During the OEF conflict, First Rock Paratroopers deployed three times to Afghanistan: Operation Enduring Freedom VIII in 2007 to 10 rugged districts of Eastern Paktika Province, Operation Enduring Freedom X in 2009 to the mountains of Wardak Province, and Operation Enduring Freedom XIII in 2012 to various districts in Logar and Wardak Provinces and ultimately the contested region of Southern Ghazni Province to transition security operations to the Afghan National Security Forces (ANSF). 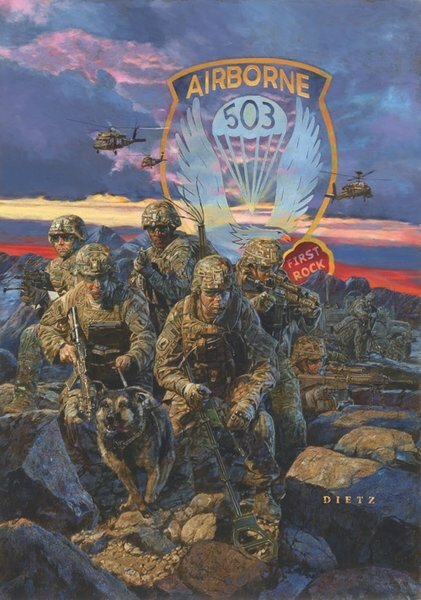 The subordinate units of TASK FORCE EAGLE consisted of Paratroopers, Soldiers, Sailors and Airmen from Headquarters and Headquarters "Workhorse" Company, Alpha "Attack" Company, Bravo "Legion" Company, Charlie "March or Die" Company, Delta "Dog" Company, Echo "Easy" Company, and various enabler, advisor, and support elements from all uniform service within the Department of Defense and Department of State. TASK FORCE EAGLE partnered with ANSF consisting of Afghan National Army (ANA), Afghan Uniformed Police (AUP), Afghan National Civil Order Police (ANCOP), and Afghan Local Police (ALP) in order to build ANSF capacity and capability directed at protecting the Afghan civilian population while neutralizing insurgent networks across all of eastern Afghanistan in order to bring legitimate governance to the people. The name of this print, "EAGLE LEGACY," is a testament to the enduring impact TASK FORCE EAGLE has made on the people, communities, and partnered ANSF elements charged with the security of Afghanistan. During three OEF deployments, TASK FORCE EAGLE served in some of the most kinetic, rugged, and austere locations while targeting enemy networks, striking insurgent safe havens, and partnering and enabling ANSF to bring security to the people of Afghanistan. The Eagle Legacy to the Global War on Terrorism was paid with a heavy price as 18 First Rock Paratroopers made the ultimate sacrifice. This print is dedicated to the accomplishments of the brave and unwavering First Rock Paratroopers that deployed and fought in support of the Global War on Terrorism to bring security to Afghanistan and our Nation. First Rock!